I don’t like New Year’s resolutions. To me it’s like paving a gilded path to failure. The entire process is so grandiose and pumped up with all this undue pressure to succeed. If you want to do something, do it. 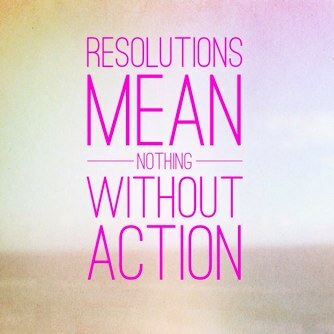 Resolutions mean nothing without action. And I don’t like saying I’m going to do something unless I’m really going to do it. Which is why I cringe at what I wrote last year as a declaration of my Three words to live by in 2013. Those words were: centered, discover, seek. Let me be frank. I didn’t exactly shine at living these words. I’ve been thinking a lot about why. And one of the reasons is that I wrote the post and shortly thereafter forgot ignored it. I didn’t centre my attention on what mattered all the time. I still let stress get to me. Which means chocolate was a mainstay of my diet. Like a daily mainstay. You’re welcome, Lindt. I didn’t pursue new interests or hobbies because I didn’t make time for them. Ya, look half-knitted tea cozy that’s been sitting in my knitting bag for like five years…the likelihood of you living your purpose is slim. I didn’t write as I intended. I wrote elsewhere (like here and here) but didn’t pay much attention to the words swimming in my head. As a result, they are still swimming. Rather impatiently. They’re making me dizzy. I may need to lie down. Remaining mindful of those words – centred, discover, seek – would mean I would need to work at achieving them. And I didn’t. Ouch. I’m not saying 2013 was a bust. I taught my daughter to ride a bike. I helped organize a social media conference, I had success in my job, and hells-bells, I turned 40! But I’m no longer going to write down promises to myself I don’t mean to keep. How about you? What’s your take on New Year’s resolutions? Do they work for you?